On the auspicious Ganesh Visarajan Day on Sunday, September 15, 2013, Hindu Temple of Atlanta devotees and guests were treated to a riveting special dance performance by visually impaired artists of Deepa Academy for the Differently Abled, Bangalore, India. 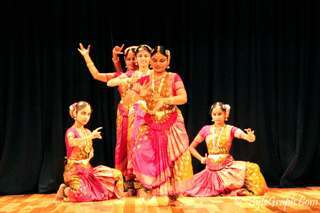 The event was in association and cooperation with Hindu Temple of Atlanta, The Greater Atlanta Tamil Sangam. (GATS), Sri Sai Temple, and Nrupathunga Kannada Koota (NKK). Past President of HTA Dr.Sujatha Reddy welcomed all and informed about the Deepa Academy. The Academy has 12 members in the touring group—six visually impaired young female dancers aged between 14 and 20; two sighted dancers who also act as choreographer and teacher, two staff teachers from the Academy, and group coordinators R. Swaminathan and R. Shivram. 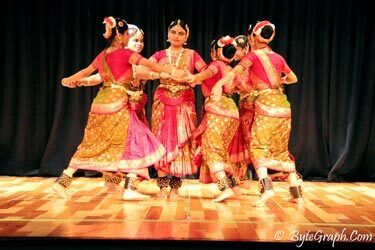 All the dancers have trained under their able Guru Dr. Suparna Venkatesh of the famed Maya Rao Institute in Bangalore. And all these dancers have successfully completed Rangapravesham and are very well trained and are proficient in different styles of classical Bharatanatyam, Kathak, and folk dances like Ghoomar from Rajasthan, Dandiya from Gujarat and Giddha from Pujab. Deepa Academy is a nonprofit charitable organization trying to help and support the blind and differently abled students to make them self-supporting and independent. Emcee R. Shivram introduced the six performers. One of the dance teachers led the six dancers on stage for orientation. From center of the stage, they went to four corners of the stage to enable them to get the idea of its dimensions. Shivram introduced the first Bharatanatyam dance. The dancers captivated the audience with their very first dance, where they paid floral and dance tribute to the deity, displaying their meticulous synchronization, facial expressions, and hand and foot movements which elicited a huge applause. The second Bharatanatyam dance was on ‘Six Chakras.’ Kundalini is power in the form of a coiled serpent at the base of spine. By awakening this serpent power and making it pass through six chakras one can transcend from mundane to divine consciousness and attain eternal bliss. This dance, too, with its sheer artistry, and flawless execution, together with musical chants of Aum mesmerized the audience. The Kathak dance that followed was set to a composition of Prabandh (one that is bound), which “brings joy to the performer and onlookers alike” said Shivram. The dance, with its graceful movements, elegance, and subtle nuances blended with music was a delight to watch. The next dance was thillana. In this stunning rhythmic dance which reflected the virtuosity of various musical instruments and musical notes, the lively dancers paid obeisance to Lord Nataraja. The rapt audience was then treated to folk dances. Kolata is a traditional folk dance of Karnataka state. Akin to dandiya ras of Gujarat, it is a soft, graceful dance performed with colored sticks. Kamsale is a brass, palm-sized rhythm instrument. Kamsale in the left palm is hit by kamsale in the right palm as the dancers move in different formations. This folk dance, too, enthralled the audience. In the final folk dance, the dancers used swords and shields in martial movements in a stylized mock battle, performing with agility, concentration, and verve. 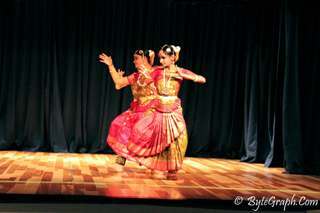 For the audience, amazed at what these visually challenged dancers could do, this was an awareness-raising experience. It was a dazzling display, an exciting mix of classical and folk dances by the Academy’s students in fetching costumes, adornments, and tinkling ghunghroos. Mrs.Sujaya Dixit, an Atlanta pioneer in Indian classical dance training, and Mani Venkatesan, on behalf of the Greater Atlanta Tamil Sangam, presented flower bouquets and token gifts of appreciation to R.Swaminathan and the entire team.